On Checkout 51’s list this week (Sept 12-18, 2013) is Polident, Any Polident product. Polident’s unique Microclean formula is proven to kill odour causing bacteria. Cleaning your dentures with Polident, as part of a daily oral health routine, helps contribute to good oral health. 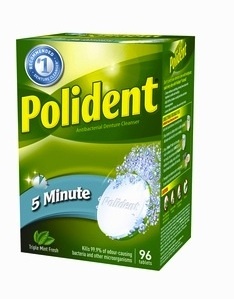 Use Polident 5 Minute every day to help maintain healthy gums and mouth. You will get $1.00 cashback rebate at Checkout 51. Here’s a pic of what it looks like. I found a couple prices of it at a few stores. I didn’t find any Polident coupons to use.